Anna Ellis is from Fort Myers, Florida and started dancing at age seven. She trained in Ballet, Contemporary, Jazz and Modern with Jorie Evangelista (NYC Broadway Dance Center) and Erin Rivera (Florida School of the Arts/Cecchetti Counsel of America). She spent a year training with Ingredients Dance Company, and went on tour with Dance Revolution in Dallas, Chicago, Orlando, and Winston-Salem. She joined the Ballet Magnificat! Trainee Events Company in September 2013 and toured with them internationally for a year. After that, she moved to Champaign, Illinois where she was offered a company position with Aaron Chen’s Filter Dance Conservatory. For the past year she performed with Artesan Dance Company in Redding, California. 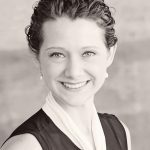 During the past six years, Anna has taught multiple styles of dance to students of all ages and has choreographed/directed three full length productions along with many group pieces and solos. Ballet Magnificat!’s Omega Company still performs her flash mob choreography on their tours to this day.